The VF-143 started out its life as VF-871, a reserve F-4U-4 Corsair squadron at NAS Alameda in 1949. It was called into action twice during the Korean War, flying off aircraft carriers USS Princeton and USS Essex. The squadron was redesignated VF-123 and received F9F-2 Panthers in 1953. In 1958 it transitioned to the F3H Demon and was again redesignated VF-53. It was around this time the squadron adopted its current insignia--a winged black lion (or as squadron lore has it, the design is actually a mythological creature called Griffin) on a blue shield. There are two tales on how the distinctive squadron name came about: One popular version is that when the Griffin design was unveiled, a female observer commented that the creature's droopy head and gaping mouth made it looked like a dog throwing up. A few claimed the nickname originated in Vietnam when a USAF F-105 pilot remarked on how the beast resembled a vomitting canine! Either way, the legend of the World Famous Pukin' Dogs had begun. In 1962 they were once again redesignated VF-143 and transitioned to the Phantom. They went on to deploy for seven Vietnam cruises along with their sister squadron VF-142 Ghostriders. The downing of a MiG-21 in 1967 proved to be one of the highlights of the squadron's long deployment in that theatre. In 1974 VF-143 left their F-4Js behind and upgraded to the F-14As. After the transition was complete, they moved from their long-time home NAS Miramar to NAS Oceana in 1976. The Pukin' Dogs became the first to fly combat TARPS missions when they flew reconnaissance sorties over the war-torn Lebanon in the autumn of 1983. VF-143 was also the first to deploy with the F-14A+s (now known as the F-14Bs), this occurred in March 1990 aboard USS Eisenhower (CVN-69). When Operation Desert Shield broke out in August 1990, Eisenhower and her battle group rushed to the Red Sea to deter the Iraqis from further advancement into Saudi Arabia. In late August, USS Saratoga (CV-60) arrived to relieve the Ike and the Dogs headed back home. In 1994, VF-143, along with the rest of the CVW-7, switched carrier from the Ike to USS Washington (CVN-73) as the former was due for a long-term overhaul. In early 1997, the Dogs will once again change carrier. This time to the Navy's newest Nimitz-class supercarrier--the USS Stennis (CVN-74). They will be joined by VF-11, who is in the process of stepping down from the F-14D to the F-14B. Together, they will take the Stennis on a 'round the world cruise in February of 1998. 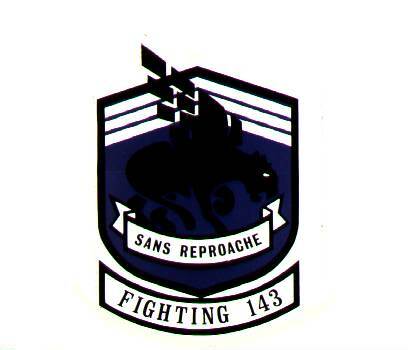 The beloved mascot of VF-143 was none other than the Pukin' Dog himself--a sculpture of a winged dog modeled after the squadron emblem, usually with a chain around its neck, mounted on top of a wooden base. In late 1980s and early 1990s, the squadron's unique and somewhat irreverent nickname was the subject of many heated debates. Some thought the name was in poor taste and questioned the Navy's judgment on allowing a fighter squadron to carry such an appellation. Of course, there were many Dog supporters who vehemently disagreed. The decision came down from the Navy was to have VF-143 drop the Pukin' part, thus the squadron is now officially known only as the Dogs. Naturally this upset a lot of former and current Dogs, and many Dog lovers. However, in the era of pervasive political correctness, the change was inevitable. The good news is that sometime in late 1996, VF-143 was once again officially recognized as the Pukin' Dogs by the Navy. It seems that the PC police has lost a round! May the Dogs puke forever! The image below shows a VF-143 F-14A in the all over grey scheme with high visibility markings and is thus representative of mid-1980's markings for the Pukin' Dogs. The present scheme features low visibility national insignia, the 'AG' tailcode has been moved to the inner surfaces of the fins and three black sashes stretch from the lower fuselage to the front cockpit, much as on VF-102 and VF-103 aircraft.